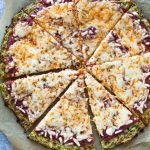 Finally, a tasty crispy low-carb zucchini crust pizza that is sure to satisfy your pizza cravings with out all the added carbs! 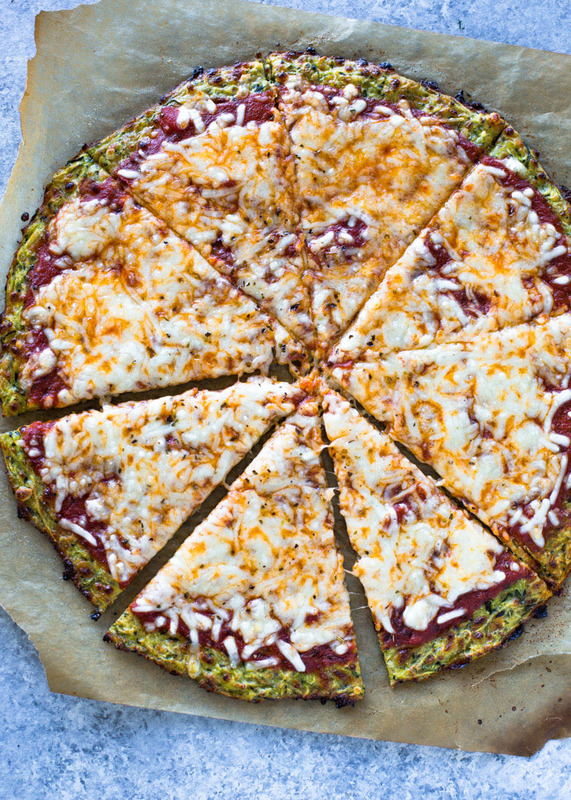 I’ve shared a series of low-carb pizza recipes over the years using cauliflower and broccoli, but this time things just got a whole lot better. Today, we’re going to be using zucchini as the base for this delicious pizza. If you’re still a bit skeptical about zucchini, jump over to my zucchini archives and see all the delicious non-traditional ways zucchini can be cooked! This zucchini crust pizza is like no other you’ve had before. The crust is thin, crispy and delicious and can hold up a few toppings too. It’s loaded with cheese and Italian spices so it’s got a tasty kick to it that you won’t get from regular pizza dough. It all begins with shredded zucchini that is then place on a few layers or paper towel and sprinkled with salt. This helps draw all the moisture out of the zucchini for a crispy crust. Next, shredded cheese, an egg, flour, and spices are added to make the dough. The dough is then baked without the toppings for 10 minutes to get it all crispy, then it is removed from the oven and from here, you can add your favorite sauce, cheese, and toppings and return it to bake for another 5 minutes until the cheese is melted and gooey. Pre-heat oven to 500F. Line a baking sheet with parchment paper and spray paper with cooking spray; set aside. Place shredded zucchini on a plate lined with a few layers of paper towel. Sprinkle with one tablespoon of salt. Set aside for 10 minutes. Squeeze the excess moisture out of the zucchini by wrapping it up in the paper towels or clean cheese cloth and squeezing out all the excess water. In a medium bowl, combine the shredded zucchini, flour, egg, cheese and Italian spices. Combine mixture with a spoon until fully incorporated then transfer mixture on to greased parchment paper. Press the dough into the desired shape and thickness (we like 1/4'' thickness) on the greased parchment paper. Bake for about 10 minutes until the crust looks set and the bottom is starting to brown. Carefully remove the pizza crust from the oven and top with sauce, cheese, and toppings if desired. Return to oven and bake for another 5-7 minutes or until the cheese is melted and bubbly. What can I use in place of the flour? I’mean trying to get recipes that are gluten free. I would love to try this recipe! You can try replacing the flour with almond flour to make the recipe gluten-free! So I TOTALLY love this!!! The only thing is the crust does not seem to crisp up? I left it in for over 20 mins the EDGEDs started to BURn.. I even made sure to get all the water out of the ZUCCINIE! My mother cannot have dairy and loves pizza. Any suggestions on the substitute for cheese in the crust? Love to surprise her with a pizza! I haven’t tried it without cheese but here is a link to a few great dairy-free alternatives to cheese!